CLICK HERE to recapture the Electronics Componants page. The only control I find to be mentionally different than what a Player would expect from standard electric guitar controls, ....is that with both pickups selected 'On', then the neck pickup volume control rolled off slightly will accentuate the bridge pickup's trebly presence in that mix more than is usually expected with standard guitar controls. Otherwise, with both pickups both selected 'On' and both Volume Controls up full, the mix is heavier toward the Neck pickup's bassier sound. This is due to (1) With both pickups on the pickups and both of their respective control pots are in parrallel with 2 quite different filter capacitors, thus rolling off one pickup's volume control sends more signal through the other pickups volume and tone pot / filter cap, and; (2) The pickup leads running in the ground shield conduit are not shielded from each other in the conduit so there is some crosstalk between the pickups, which further accentuates the rolloff of either pickups volume and tone pots when both are selected 'On', particularly the volume pots effect / accentuation of tones. NOTE: Were the pickups wired in series rather than parallel as they were at the factory, then both pickups selected 'On' would have double their electronic output. And although apparant / ear sensing of volume reduces exponentially squared (db^2), the increase in apparant / ear volume is noticeable and even more dynamic than the high dynamics these pickups already have. 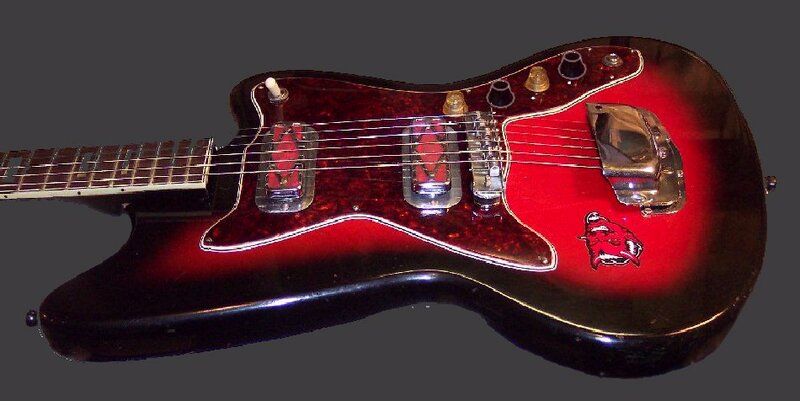 Even a push-pull switched pot retrofitted in place of the neck pickups tone pot (merely a good ergonomic position) could afford parallel / series switching choice; But of course save the original pot for the guitar's future and change-back if desired. THE TONE POTS SWEET ACOUSTIC-LIKE RYTHM SPOT: For either pickup selected 'On', roll it's volume control back to about 8/10, ...and roll it's tone pot all the way off, ...then slowly start turning the tone control back up until the treble tones first start to be heard AND STOP. At that controls positions you will have a very nice acoustic-like rythm tone that can be trimmed to sound like a fatter or thinner acoustic guitar by fine trimming the tone control ever so slightly up for fatter tone and down for thinner tone. Once a desired tone is found, then the volume control finely adjusted will further fine trim the acoustic tone. This same technique can be used to combine sweet spot settings with both pickups 'On', ....but the tone control of each pickup will have to be found separately while the other pickup is switched 'Off", ....and when both pickups sweet spot is found separately, then they can both be switched on. ~~~~~~~ This sweet spot is a great spot to start searching for Jazz tones as well. THE "MARSHALL" AMP SOUND: These DeArmond pickups will make just about any amplifier that has preamp gain controls take upon more and more tones & sounds much like Marshall amplifiers as the preamp gain(s) is turned up. If a certain amp doesn't have preamp gain control, then similar sounds will occur as the amplifier volume approaches being turned up all the way. ~~~~~~~ These pickups high gain tones are also outstanding for partial hand-heel strings muting at the bridge for high gain rythm and partially muted tones. The black knobs are artificially hi-lited here to see them better in this picture.